The movie centers on the 2013 trial of abortionist Kermit Gosnell, who was ultimately convicted of three counts of murdering babies alive and the involuntary manslaughter of a patient who died of a drug overdose during the 2009 abortion of her 19-week-old baby. As a result, much of the film takes place in the courtroom. In the scene, aggressive defense attorney Mike Cohan, played by the film’s director Nick Searcy, cross-examines abortionist Dr. North (Janine Turner), brought in by the prosecution to show how far Gosnell has transgressed accepted medical norms — even in an industry dedicated to death. Through the series of questions, Cohan seemingly attempts to soften the jury to believe that there’s not much difference between aborting in or out of the womb — that it’s arbitrary, really. The implication being that Gosnell really didn’t do something that bad and as such didn’t deserve to be found guilty of murder. It’s a huge question, for if the answer reveals that the unborn baby is equivalent to the infant, then abortion is morally equivalent to infanticide (murder) and our nation is guilty of a leviathan-sized sin. The sin extends beyond abortion to destructive embryonic research and the frozen preservation of countless embryos at in-vitro fertilization clinics. It extends to fetal rights, too. However, if the fetus holds a lesser moral worth than the newborn, then the pro-life side is guilty of injustice on a massive scale by preventing women from seeking their rightful abortions. Either way, the repercussions are tremendous. It’s a moral question that society must genuinely analyze, as more than 59 million babies have been aborted in the U.S. since its legalization in 1973. It’s fair to want a concrete answer to the question, free of rationalization, politicizing, and extremist arguments. Whatever the case, truth stands on shaky ground without its fullness, which is ministered by knowledge and reason — objective and irrefutable. It does us well to test our opinion with the weight of facts. That’s what this series is about. In a similar vein to what atheist-turned-Christian Lee Strobel did in his search to find the truth about Christ’s resurrection, I take you on my journey to the heart of the matter. This journey began more than 10 years ago as a former pro-choicer. We’ll explore some of the evidence — documentary, historical, scientific, psychological, and circumstantial — that figured into my verdict. My search for the truth started in a college classroom. I still remember my biology professor changing gears to the topic of contraception during a lecture on early human development. The comment startled me. While, I was pro-choice at the time, it stirred something within me. Perhaps, it was a pang of conscience as I still held onto some vestiges of the Catholic faith I would later return to. Plan B (still fairly novel at the time), was touted by my professor as an “emergency contraceptive.”Also known as the morning-after pill, it acts via two pathways — one of which prevents fertilization, but the other of which stops the embryo from implanting in the woman’s uterine wall, essentially leaving it to die. That second method caught my attention. Based upon what we had learned minutes before, that action seemed to belie Plan B’s label as an “emergency contraceptive.” Even to me, a student in Biology 101, it didn’t make sense — it seemed this drug was leaning into abortifacient territory. If it was abortifacient, suddenly a young woman’s decision is much weightier. As a curious journalism student with a heart for science, I was compelled to find the truth. The answer, I knew, would be predicated on whether the embryo is human or not. With thousands of scientific and medical journals, textbooks, and studies at my disposal, I needed to narrow down where to start. So as any good journalist would do when unpacking a complicated story, I went back to the beginning: the basic building block of life, the cell. Knowledge of the cell — and hence of the beginning of life — eluded us for millennia. Even brilliant Aristotle got it wrong, claiming living organisms spontaneously generated. It escaped us down the centuries, too. Dr. William Harvey, who made pivotal contributions to science in the 17th century, got closer with his theory of omne vivum ex ovo (all life originates from an egg), but still missed. It wasn’t until Matthias Schleiden and Theodor Schwann developed cell theory in 1839 that we started getting somewhere. The discovery that all living organisms are composed of one or more cells set the stage for scientists to understand that human life operates on a continuum — changing forms during its development, but never its nature. The embryo, biologists determined, met all the qualifications of life established by centuries of scientific research. As a result, medical associations, journals, and professionals set the moment of conception as the point that human life begins. By 1859, this broadly-accepted knowledge led the American Medical Association to strongly oppose abortion, stating that human life is begun at conception. Ditto for the American College of Pediatrics, which still holds that position. In other words, even though the embryo’s humble appearance disguises the complexity of the processes underneath, it’s an objective reality that from the moment of conception, life is in motion. The tiny zygote — smaller than the head of a needle and wholly unfamiliar to us — is already genetically distinct from her father and mother, possessing its own DNA, the golden record, if you will, that dictates and coordinates all our life processes. In fact, the one-cell embryo already contains the genes that will determine the individual’s growth and appearance, including traits such as hair color, eye and skin color, height, and whether she will get her father’s nose. A 24-week-old baby rests in mother’s womb in this photograph by respected photographer Lennart Nilsson. HUMAN CELL(S) OR HUMAN BEING? Even so, I found that a cursory glance on forums across the internet revealed our first rebuttal: People insisting the growing embryo is “just a mass of tissue” or a “pile of cells.” Many of my classmates held the same opinion. Whenever disagreement arose, they blamed differences in ideological or religious beliefs. It seemed as if the claim to humanity was almost a subjective determination. To be fair, I could relate. 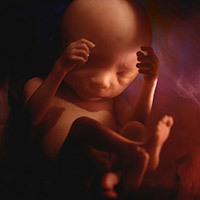 After all, it takes some immense mental calisthenics to imagine a tiny zygote becoming the recognizable fetus we see in ultrasounds around the 20th week of gestation. For the first couple of weeks, the embryo lacks the recognizable features many of us attribute to human life: hands, feet, a beating heart, etc. It’s tempting to think the embryo only becomes human after a certain point — it’s just so different. So despite the research pointing to conception as the starting point of human life, I still had my doubts. I wanted something airtight. Would science provide that? Once again, I found that science answers unequivocally: The embryo is and has been a human life since conception. Why? First, we must define what a living thing is and then determine if our one-celled embryo meets that definition. At its most basic, a living being is an organism. Medical and scientific texts define an organism as a living thing displaying all the characteristics of life (nutrition, respiration, movement, growth, homeostasis, and more) and carrying those out through means of interdependent parts or organs. For example, plants, animals, and even fungi are organisms. Embryology shows us that from conception onward the embryo already meets both parts of that definition. Though tiny, the one-cell embryo possesses interdependent parts. Within the first 24 hours of its existence, it “consists of elements (from both maternal and paternal origin) which function independently in a coordinated manner…” the American College of Pediatrics states. It has multiple cellular “organs” working in unison. It also acts uniquely — in the manner of an organism to be precise, carrying out the activities of life in a way no other human cell (or group of human cells) could ever dare to match.5 In fact, within minutes of fertilization, the one-celled embryo has begun the delicate work of replicating its DNA in preparation for cell division — cell division that will lead to new organs, blood vessels, limbs, a brain, etc. Simultaneously, the embryo is also protecting itself from polyspermy (fertilization by more than one sperm cell), a recipe for embryonic death. “From this definition, the single-celled embryo is not just a cell, but an organism, a living being, a human being,” the American College of Pediatrics sums up. It started becoming clear to me, then, that we’re not just talking about a random mass of cells. The embryo, even this early in development, is at the organismal level — the human organismal level. To be certain, this is a growing human child, not just a “pile of cells” in the woman’s uterus. I had been duped by my forgetfulness of the fact that human life operates on a continuum, merely changing form but never its nature. And this irrevocable, objective evidence had reminded me. By about Day 6 or 7, it is settling into the safety of the uterine lining — the first contact between mother and child.7 By Day 10, the tiny being has triggered a cascade of physiological reactions that let her mother know something is different. “I’m here,” it seems to tell her. Give her eight more days and her tiny heart will be pumping blood. After six weeks, the embryo looks a lot more like us and can technically be called a fetus. By day 56, all her organs are present and she can even feel pain.8 At nine weeks, the baby has mastered the somersault, kick, and backflip. Note that this is all happening within the first trimester. Science had spoken clearly of humanity’s inception, but the question of moral worth still lacked an answer. For that, I had to consult evidence of another sort. 1 Hartig, Hannah. “Nearly six-in-ten Americans say abortion should be legal in all or most cases.” Pew Research Center, 2018. 2 “Induced Abortion in the United States.” Guttmacher Institute, 2018. 3 Marieb, Elaine, and Hoehn, Katja. Human Anatomy and Physiology. 8th Edition, 2012. 4 Kischer, CW. “The corruption of the science of human embryology.” ABAC Quarterly, Fall 2002. 5 Condic, ML. “A Scientific View of When Life Begins” On Point, June 2014. 6 Marieb, Elaine, and Hoehn, Katja. Human Anatomy and Physiology. 8th Edition, 2012. 7 Hamberger, Lars, and Nilsson, Lennart. A Child is Born. 4th Edition. 8 Hensley, Jeff, et al. The Zero People. Servant Books,1983. 9 Kaashif, A., Frey, C, et al. “Two-year neurodevelopmental outcome of an infant born at 21 weeks 4 days gestation.” Pediatrics, December 2017. 10 Pacholcyzk, T. “Embryology or theology?” Making Sense of Bioethics, February 2006.